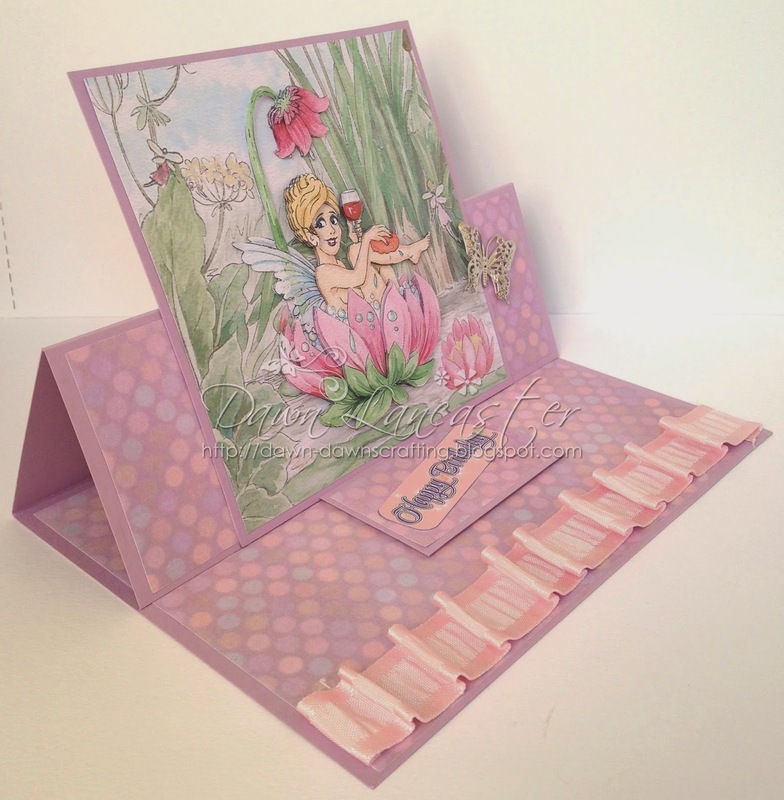 Today I'm sharing a little fairy easel card with you! Perfect for so many occasions! The DP is from the CD & there are many more on there! you can see it in the picture! I love all the detail in the background, it seems such a shame to cover it up! Here's a little view from the side showing the fold if you're not familiar. You can also see the dimension of the ruffled ribbon! Thanks so much for popping in, your visits are appreciated! If you have time to leave a comment, I'll know you've been & can return the favour! 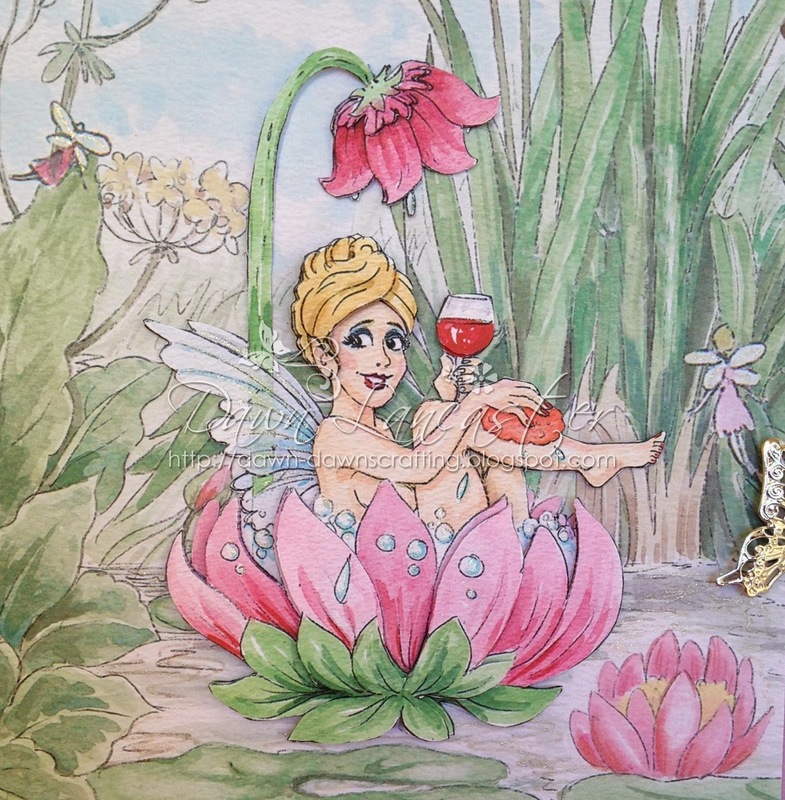 Such a cute design :) love her glass of fairy wine! 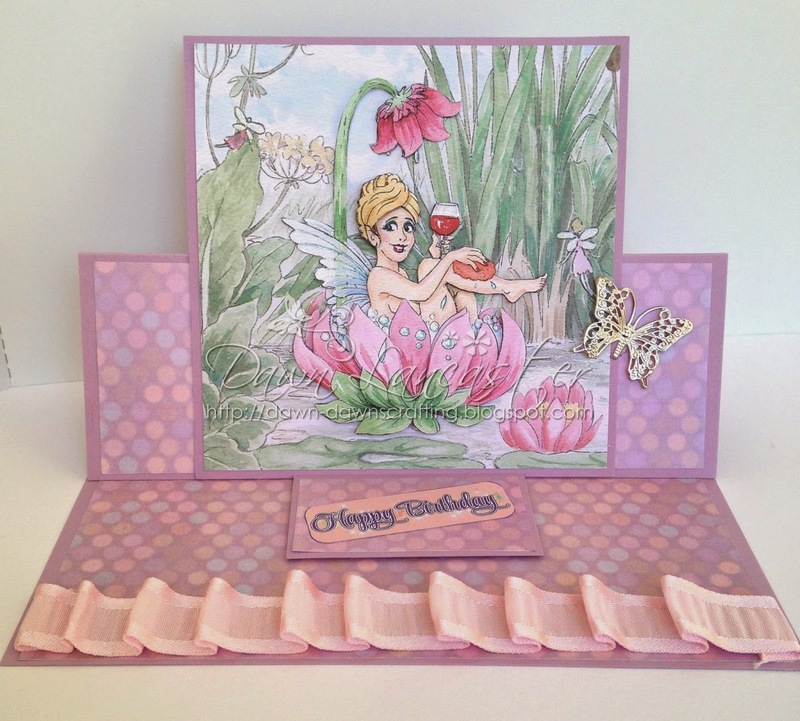 A beautiful card Dawn, such a pretty image and lovely soft colours. What a great card Dawn and would love to be in that bubble bath with wine ! Beautiful coloring and design Dawn! Thanks so much for joining us at The Sisterhood’s ‘Come Fly With Me’ challenge and please come back again soon! Hi Dawn, this is gorgeous, I love the image and beautiful papers. Love that image and the beautiful colours - great easel card! Thank you so much for sharing it with us over at the Sisterhood of Crafters and for playing along with our "Come Fly With Me" challenge. A great easel card Dawn. Loving the image. Thanks for sharing with us at Penny's Paper-Crafty Challenges. Hi Dawn, a lovely easel card. A really cute image and lovely colours. Oh goodness, I love the fun image! Fabulous card Dawn, did you pose for it? Lovely to see you Dawn and with such a great card. Thank you for joining in our Challenge. A gorgeous card and I love your finishing touches. Thanks for joining in at OLLCB. I think this is a fabulous CD and I love how you have used the image. This is fast becoming my favourite image on the CD. This is great, love that image and you've made such a fun card. So very pretty, dont have this CD but will it to wish list . Thank you soo much for taking part in our " Boys and Girls come out to play” challenge over at Penny’s & good luck in the draw. Gorgeous creation. I agree the background is too pretty to cover up. Wish there was a way to really show case the glitter in photos. Thanks for joining the Sisterhood's "Come Fly With Me" challenge. Beautiful easel card - love all the details you've added.